Samsung today announced the UD590, a new 28-inch 4K monitor that will go on sale this April in the US market for $700 (Via Engadget). The UD590 model includes a 28-inch display with 3840 x 2160 resolution, 1 billion (10-bit) colors and 1 millisecond response time, making it suitable for gaming or watching high-action sports or movies. The UD590 ships with a picture-in-picture feature that allows users to connect two computers to a single monitor and view both desktops side-by-side. This same option provides a single user with the ability to view different content in two separate windows without a drop in resolution. 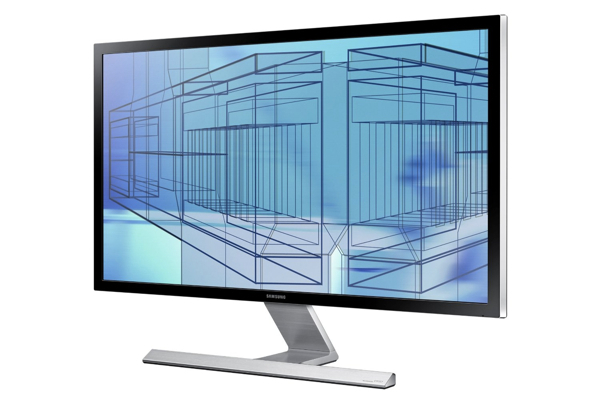 Samsung's UD590 monitor has a minimalist design with a simple T-stand and color options of silver or black. It features two HDMI ports, one DisplayPort connector and no DVI ports. The UD590 can be pre-ordered now for $699 and will start shipping April 18th. This is the year of affordable 4K monitors with other manufacturers also selling 28-inch displays with sub-$1000 price tags. Lenovo will start selling the ThinkVision Pro2840m in April for $800, while Asus plans to launch its own $800 28-inch offering in Q2 2014. Announced earlier this year, Dell already is selling the 28-inch 4K P2815Q for under $700 on its website. For those interested in 1080P monitors, Samsung also announced the SD390 and SD590 models. Both monitors will be available in 23.6 and 27-inch sizes and will feature a combination of HDMI and VGA ports. Pricing will start at $250 for the D390 and $310 for the SD590 when the monitors go on sale later in April. TN panel = no buy. They basically did the same thing as Dell, ASUS and Lenovo. I'd rather pay significantly more to get an IPS panel. Don't they think there's a market for ~$1,500 IPS 4k 27-28" monitors? I'd rather move up in size from my current 8-year-old 24" monitor, and 32" is too big for my desk and too expensive for my wallet. TN and no Thunderbolt? Fail. Just another mediocre Samsung product that falls all kinds of short. There are tons of gamers out there who crave faster-than-IPS response times and who want to play at high resolutions. The fairly affordable price is a bonus. For them this monitor is ideal. I doubt many of them care much about Thunderbolt since most of them probably aren't playing games on Macs. For programmers this monitor also fits the bill because having lots of crisp text onscreen is important to programmers, but color fidelity usually isn't. For photographers, UX designers, graphic artists or other creative professionals I wouldn't recommend this monitor. For them, yes, this is a fail. "Programmers" aren't nearly as common as you think anymore. I'm a "software developer" and you have to be ready to do a lot more than just stare a lines of code all day. IPS is a big difference maker for me. TN on a panel this large? No thanks. With TN on a panel this big, the same color on the top, bottom, or sides is going to look very different from the middle. Really horrible tech and shouldn't even be used on these cutting edge 4K resolution monitors. IPS = slower response times, excellent colour reproduction, good viewing angles. I'm by no means an expert either, and granted the IPS display in the iMac is pretty fantastic, but I have a display that would be fairly similar in a lot ways but is TN next to it. It's a night and day difference for me. I find the IPS is far superior and likely wouldn't buy another monitor if it weren't IPS. You're kidding right? That's not the demographic who would spend $700 on a monitor. But guess who would? I know a few moderately serious gamers and when they do a build they are generally spending 3-5K.. they could easily drop that kind of money on a display. No VESA mount, no height adjustment = fail.